Welcome to my zen gardens. The above image is is what you first see as you approach my home near my front porch. 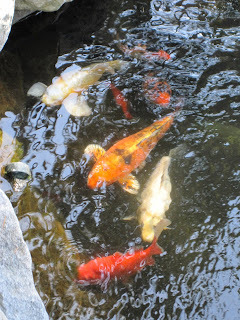 The below image is the smaller pond next to my front porch. My husband and I built these ponds and gardens from scratch. I am the one with the ideas, the planner, the collector of rocks and statues...my husband is the muscle man, the mover, the hole digger and over all handy man. This garden is no metaphor... more a task that swallows you into yourself, earth using, as always, everything it can. --- Jan Hirshfield. My next post will feature my new greenhouse which I love and am very excited about. As in your artwork, such a wonderful sense of design and placement. 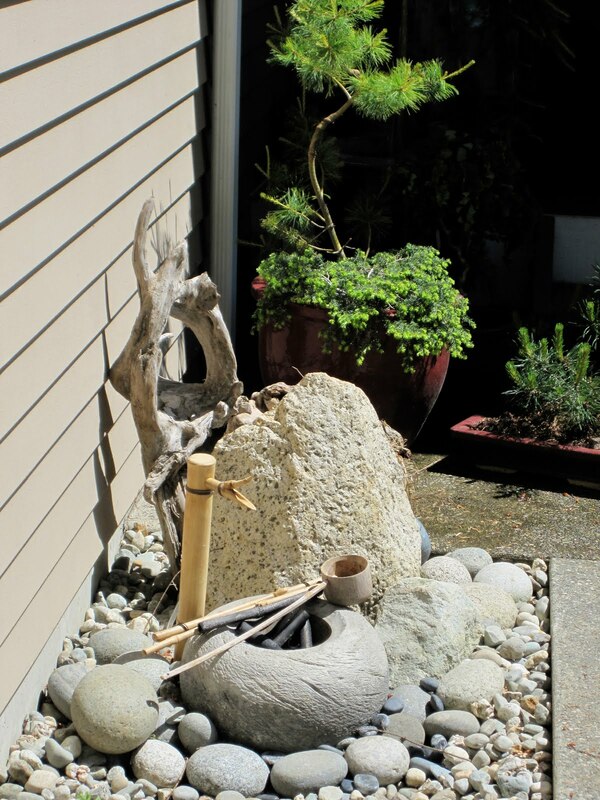 Your inner serenity and equanimity shine through in this amazing zen garden. I would blend into it very well as I am green with envy. Wow! Did you design this garden from scratch? I would never be indoors if it was mine. your garden is just beautiful! thanks for sharing. Truly using your artistic skills with nature--a piece of paradise. Your gardens are stunningly beautiful! Just fabulous, Donna. Thanks for showing us your lovely, tranquil world! The loveliness of the garden makes me catch my breath. I know how.....much work it takes to make something this beautiful and serene. The quotes are wonderful and inspiring. Thanks as always for sharing your talents with us. gorgeous, peaceful loveliness! thanks for inviting us in! The perfect setting on a cliff starts it off and then the garden becomes it's own beauty. I would say these photos rival your photos of gardens on your recent trip to Japan. Thank you for sharing bits of your everyday heaven. i am in love with your garden (and home) and am always so thrilled when you share photos. i would live outside, i think, if i had your gorgeous gardens. i most certainly would get a lot less each day, though i would most definitely not complain. can't wait to see your new greenhouse! we haven't a huge yard, but have been considering how we might make a small one for our our produce and of course orchids (i love growing them, but generally end up killing them -- they are, i believe, the only thing i can't grow well). what will you be growing in your greenhouse? Donna what a stunning garden. I never understand how artists have time for gardens. I always feel pulled garden or art. But then this looks like a low maintenance garden. I love the quotes, thank you. There is such a sense of congruence in all that you share...art, quotes, photos...no piece out of place...tranquil mind outpictured...so 'of the TAO'..thank you for the sanctuary that you consistently offer us...so hopeful, so beneficial...so deeply appreciated. outer and inner shared, complete, and created in sync with one another. What a lovely place you've created, Donna. I share your love of gardening though I don't have such a helpful resident handyman. We have no lawn which makes gardening a bit less demanding on a regular basis so that helps. 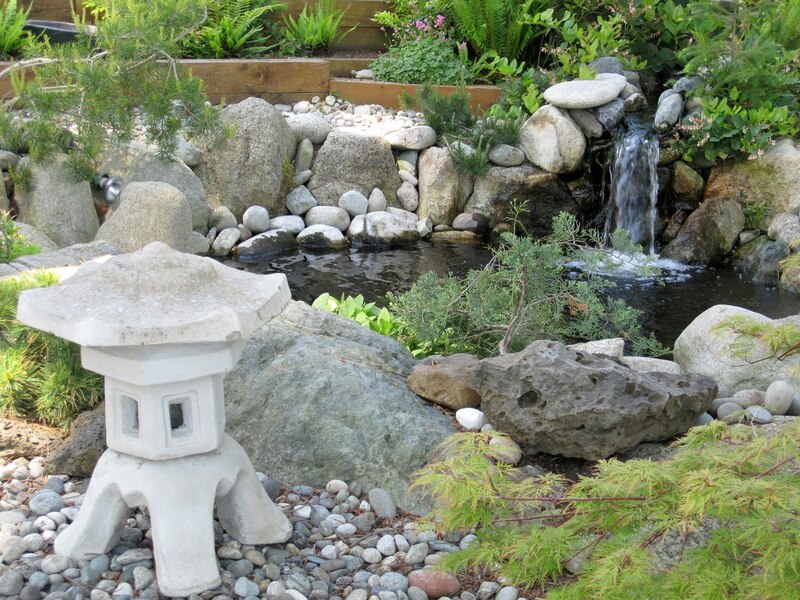 Making and keeping an artistic garden is so similar to collage... a blending of elements to make a beautiful whole. I bought Randall's book and especially liked the section about you and your work. You're still at the top of my list of great ones. Your gardens are beautiful songs! My gardens are always in the state of flux, but they don't look anything like yours! sigh! 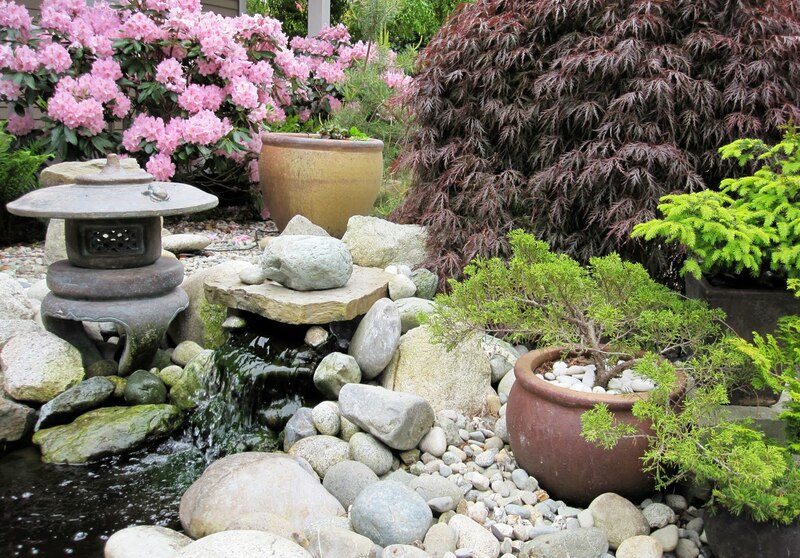 Your landscaping is just so beautiful...I can just hear the waterfall & breathe in the sweetness of it all. Can't wait to see the greenhouse! You've created such a beautiful setting in a beautiful location. It's always a pleasure to visit, I just wish it weren't such a long drive! And to think that when we first met you didn't even like gardening! I'm so glad it's just another interest we can share. your garden is so beautiful, really peaceful and calming. I'm curious about your greenhouse! I am rather too late with my comment, it has already all been said by those commenting before me. Thank you for this glimpse of your garden, I am seriously envious. Stunning!! I'm so impressed you built all this from scratch. 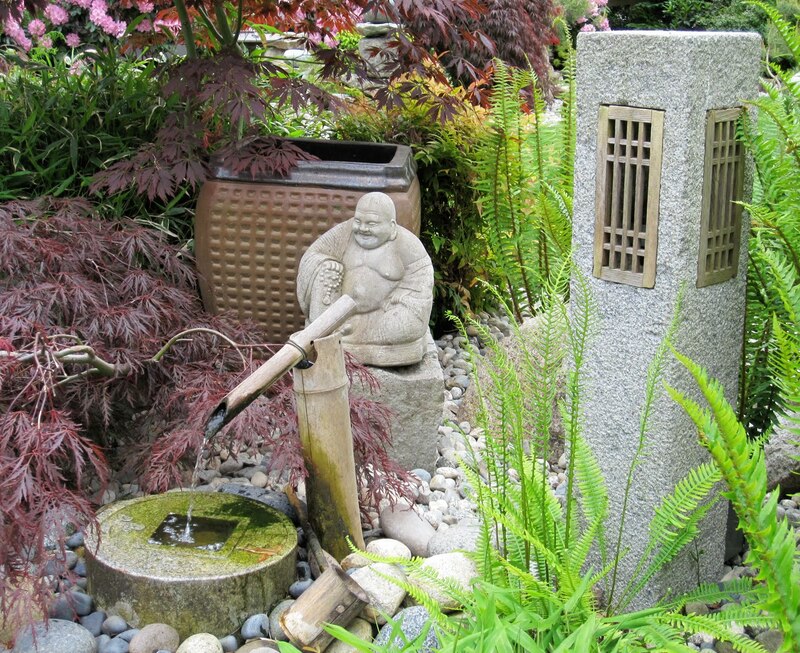 what a peaceful pleasure it would be to stroll through your garden, and IS vicariously. Thanks for the stroll. You have done a lot of loving work through the years and created a masterpiece. Your beautifully designed garden looks like a peaceful retreat.. i can feel the calm just looking at your photographs. 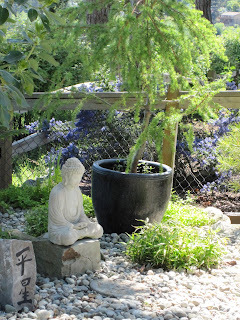 Gardens provide so many therapeutic benefits! What an inspiring place you developed here...just wonderful. 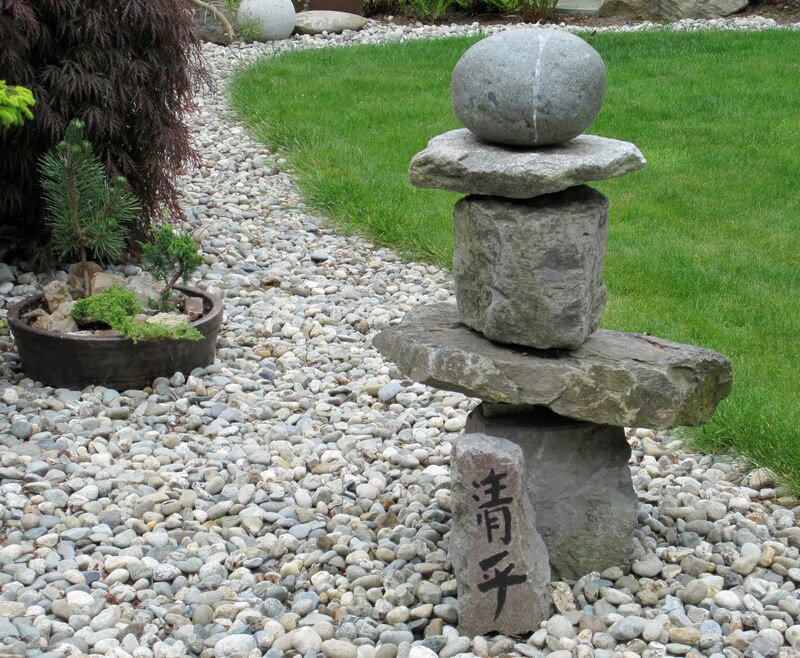 gardens seem to be on everyone's mind these days as summer is readying for solstice! 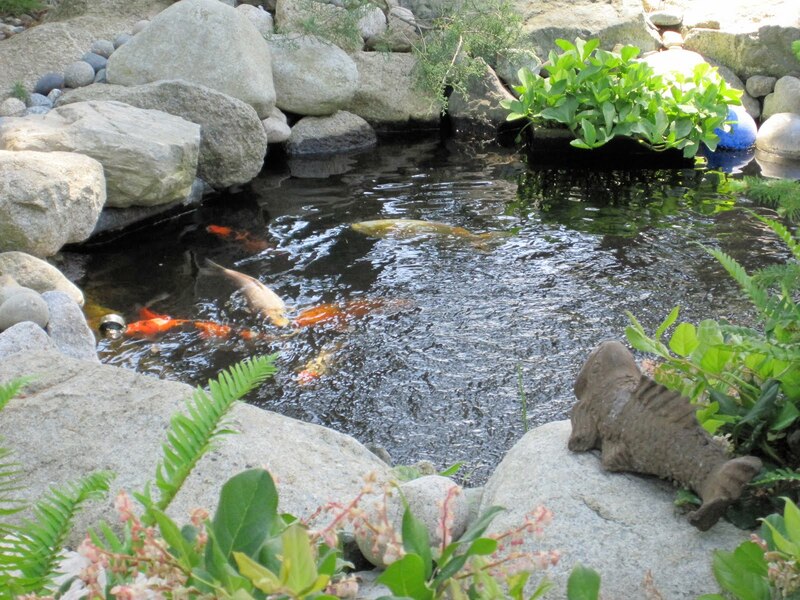 :-) Beautiful gardens, Donna -- thank you for sharing! your garden must be such a lovely place to stay in, to find one's true centre. I love seeing the color contrasts that are possible with the japanese maples; the deep purply red and the brilliant chartreuse. Your garden composition brings to mind the temple gardens of Japan that I've visited only in literature and the very real Japanese Garden in Golden Gate park. Thank you for the retreat via words and images! Wow! Beautiful and wonderful gardens. Wonderful images of your wondrous gardens...How enchanting to be surrounded by such beauty. Yours is the most beautiful garden I have seen. Clean lines, interesting elements and artful arrangements. Thanks Donna. Ce jardin est un jardin d'artiste dont la composition met en valeur, non seulement l'espace mais les plantes et les éléments. Le land art est très proche de cet esprit et j'ai beaucoup de plaisir à regarder tes photos. So inspiring! You and your husband are a great team and have done a wonderful job.It's always a pleasure to visit your place. Can't believe I nearly missed this post! 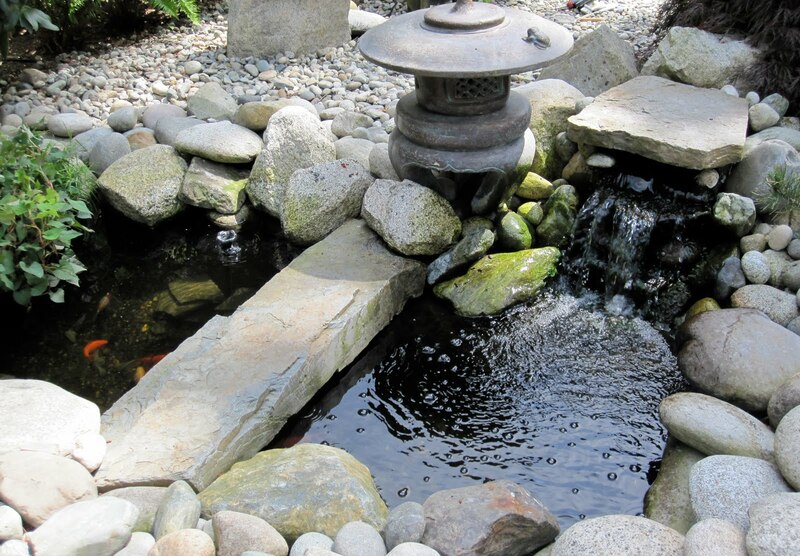 Your garden must be the most tranquil, soothing place to sit and absorb the beauty. I love the running water, the maples, the stacked rocks and the koi ponds. we wanted a japanese garden..
we got half way there...the beautiful mapale and water feature with the bamboo scoop..
he ate the bamboo scoop and used the water feature as his personal drinking bowl. thanks for the visit. I appreciate how much work goes into it.. Your garden is a dream! Beautifully designed ... a veritable paradise! Thanks for sharing your private oasis with us! Now I can hardly wait to see your new greenhouse! oh my goodness, this is so very inspiring! I want one too now. 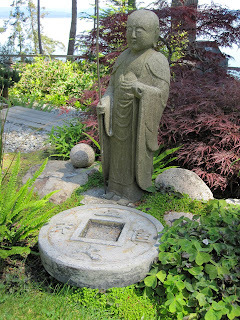 I have a little stone buddha in my garden but no water and I love the way the stones are assembled . . . .oh my so many good ideas out there! you got me thinking about Stanley Kunitz. i wonder if if His garden misses him; his voice, his touch, his puttering about. Such tranquil gardens you've nurtured, Donna. Rich with "layers." Ooooooh, I just love it! I can see that you've put so much of yourself, so much love into it. What an inviting, peaceful oasis it is! I'm just naturally in harmony with them. Drawing water and carrying firewood." 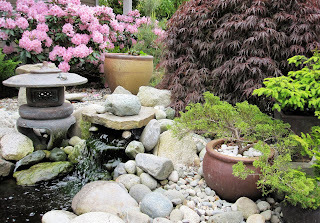 Your garden is evidence that you are in harmony with your gardening activity Donna and with your husband. I don't know about you carrying firewood, but your garden certainly draws water and is that water I see in the background of one photo? Supernatural power? 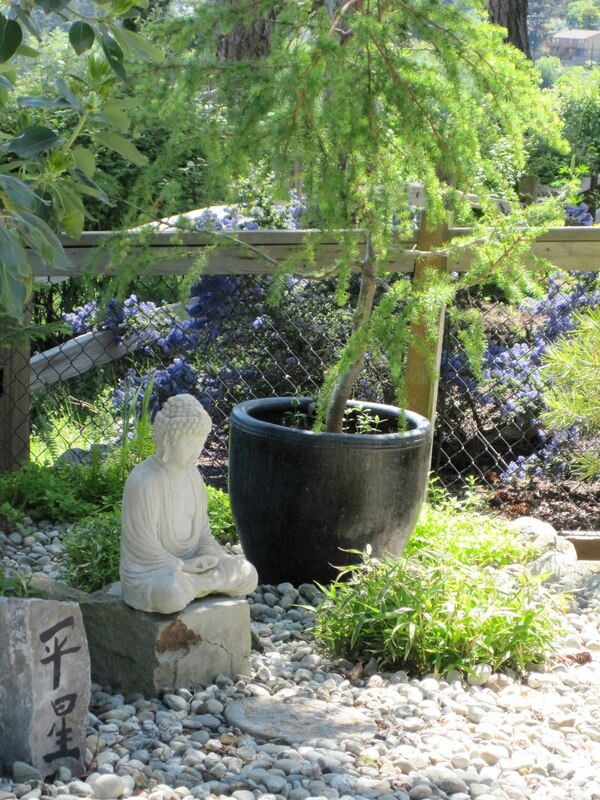 Isn't that serenity, harmony and quietude - all obviously present in the garden you have created. Congratulations on such a wonderful achievement. If there is Heaven on Earth created by a lady than this should be it!! Love,love and love! Wow! As beautiful as your painting and collage work, Donna! Lovely lovely gardens. I imagine one breathes better just by looking at them. I also enjoyed the quotes. I loved these quotes, Donna, especially the one from Kipling, and I also loved the photos of your Zen garden. What a fabulous place you and your husband have created for yourselves. Thanks for sharing it with others. Your outdoor space is like a dream. You have created something utterly magical here.